I want to point out that before arriving I hadn’t agreed on any collaboration with the hotel, so we went there with our own money. During the week we however started a collaboration, which I was glad to do because I fell in love with the hotel. 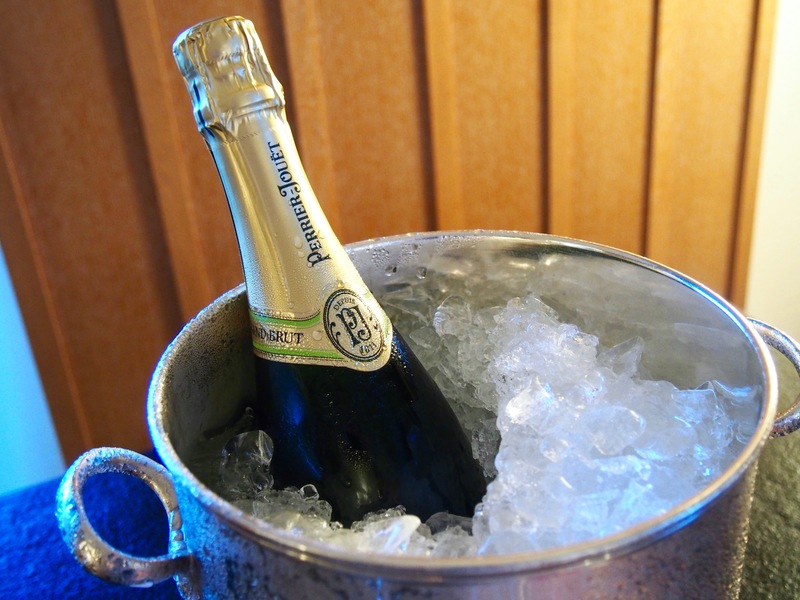 Because this happens to be the first hotel of the Ritz-Carlton chain where I have stayed at, I would like to tell you a little about the chain itself before moving onto the actual hotel review. Ritz-Carlton hotels are a part of the Marriott hotel family as well as SPG hotels after the recent merger. This means you can use for example your Marriott membership status in a Ritz-Carlton and vice versa. Ritz-Carlton is regarded as one of the best luxury hotel chains in the world, which is one of the reasons it is often seen in movies, books and other entertainment. The actual customer service inside the Ritz-Carlton brand is so legendary in the field of hospitality that people have written books about it and also many have tried to use the same approach in their companies. ”We are ladies and gentlemen serving ladies and gentlemen” is one of the known mottos of the brand. In essence this means spectacular customer service for all of the guests staying at the hotels or visiting their establishments. The idea is that they should know your desires before you even do. One of the more intriguing rules of the Ritz-Carlton hotel chain is the ”2 000 dollar rule”. This means that each employee has the power to use up to 2 000 dollars a day per guest to make your stay memorable. Some have misunderstood this and thought that it is only for fixing mistakes, but actually they can just use it to make you happy. This of course doesn’t mean that these kinds of sums are often used (and I’ve read that they can go even over that 2 000 dollar limit without asking permission), but this is just a general rule. I read about one ”2 000 dollar” example of a Ritz-Carlton employee who happened to overhear customers talking during dinner. A man said to his wife, who was in a wheelchair, that he would love to take her to the beach, but it was a shame that it wasn’t possible, because it was inaccessible for her. The employees wanted to surprise the customers by building a ramp and walkway to the beach and setting a surprise dinner for them the next night. The hotel manager didn’t hear about this until afterwards, because something like this doesn’t need any special permission from management. Of course this is an unordinary example, but still it shows how far the hotels are willing to go to please their customers. This rule might sound a bit weird from a business perspective, but actually they have calculated how much a repeat customer spends at the Ritz-Carlton properties in their lifetime and they know they will get much more back even if they spend a few thousand dollars to customer satisfaction here and there. If you want to read more about this kind of an approach of the Ritz-Carlton brand, you can read information from here and here. 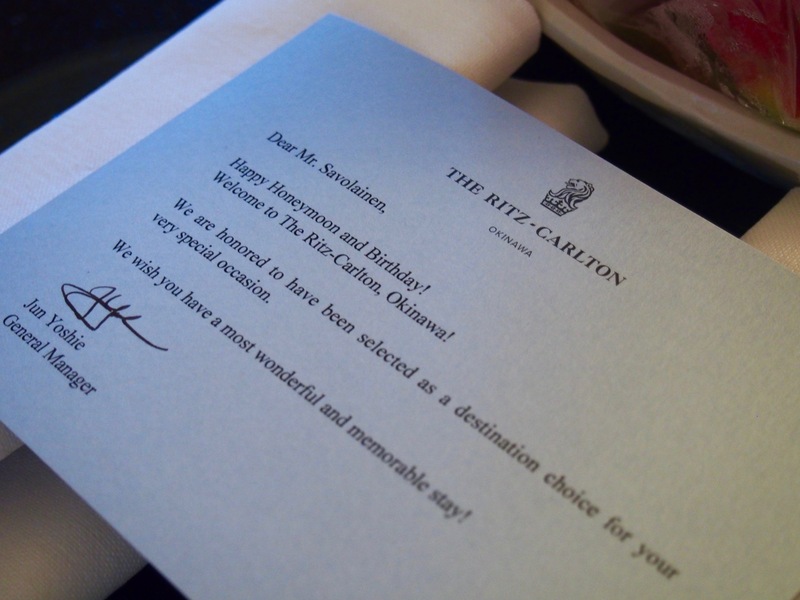 All in all, if you appreciate good customer service, you can’t go wrong with a Ritz-Carlton anywhere in the world. 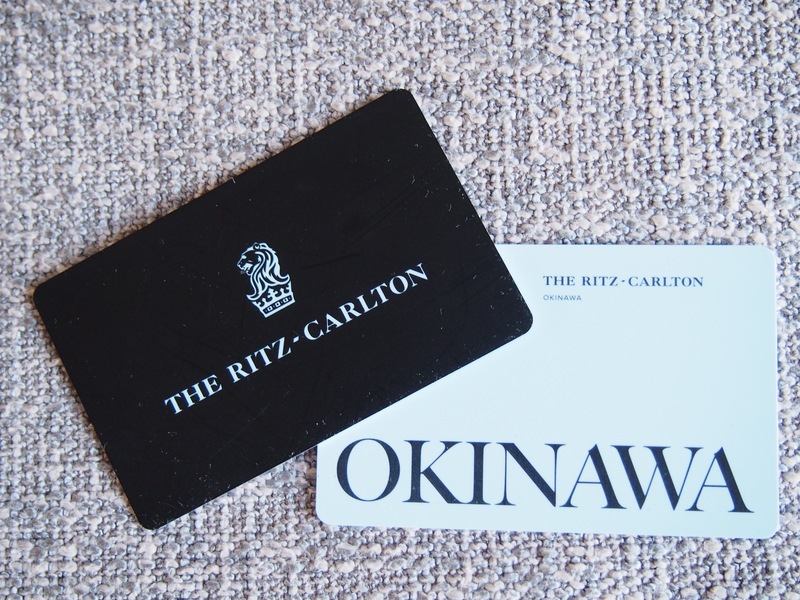 After this first experience at Ritz-Carlton Okinawa, I seriously started looking for places where they have these hotels, so that I could visit more of them. Hopefully I will get to stay at many more Ritz-Carlton hotels in the near future and write even more posts about them here. We flew the 2,5 hour flight from Tokyo to Naha airport, Okinawa with Japan Airlines. 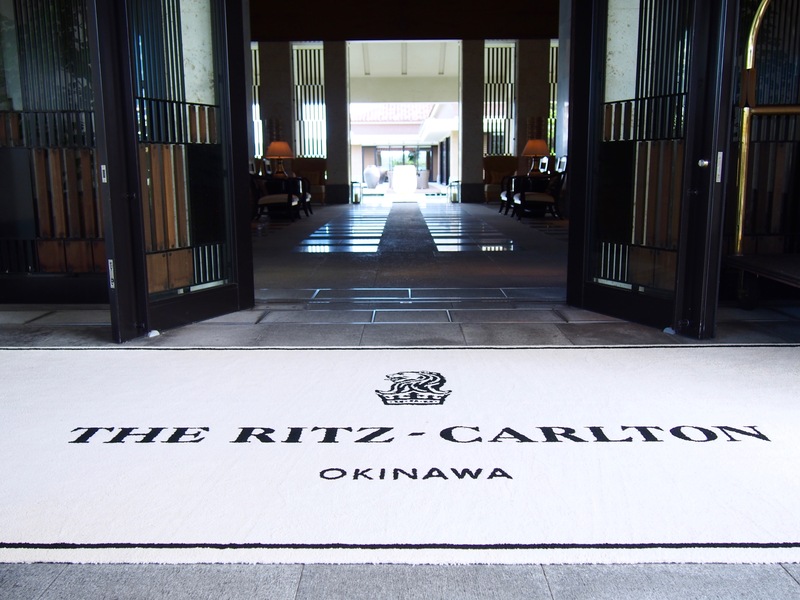 There was an option of taking a taxi or a bus to the Ritz-Carlton Okinawa, but those really didn’t interest me, because I wanted to arrive in style and comfort. This is why I asked the hotel to provide us with a car and a driver, who picked us up from the airport. I will write more about this in a separate post. The drive to the hotel wasn’t anything spectacular, because it’s mostly motorways. But when we got to the bottom of the hill that the hotel sits on top of, we started to get the idea of where we were going. Winding up the well maintained road with palm trees and lushious forest around us immediately made us realize that we had crossed onto a very different area of the island. 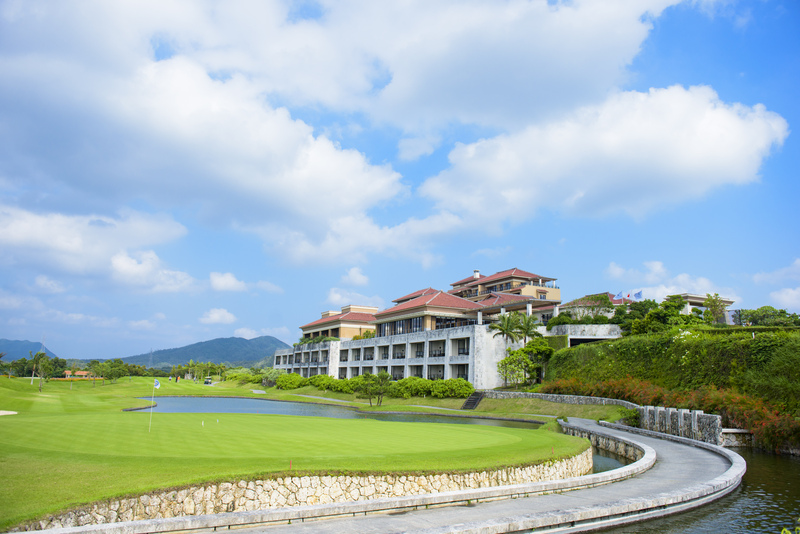 The Gusuku-like (Gusuku means fortress in the local dialect) hotel building sits on top of a hill surrounded by a beautiful golf course with the ocean below and mountains behind it. We drove up to the small, round courtyard enclosed by walls and an impressive gate which is guarded by Okinawan stone lion statues on both sides (these cool statues are everywhere in Okinawa). When the car stopped at the front entrance of the Ritz-Carlton Okinawa, the hotel employees immediately arrived to take our luggage, open the doors and greet us. This was our first stay at a Ritz-Carlton, so I didn’t really know what to expect, but I was slightly surprised by the employees attire. I would have expected black suits and tophats, but they were wearing more of a relaxed pair of pants and “Hawaii shirts”. In my opinion this is just a good thing, because it really goes well with the atmosphere of the tropical island location. In addition it’s so hot and humid that they would probably melt, if they wore suits. We were escorted through the main hall to the smaller reception area and asked to wait on the sofas while we got to refresh ourselves with moist towels and local beverages. I couldn’t keep my head from swirling around all the time, because everything looked so beautiful and exciting. It was immeadiately apparent that this would be a stay to remember. The assistant room manager Akiko told us about the restaurants, gym, pool, spa etc. that can be found from the hotel and checked us in to the hotel. When everything was clear, she started escorting us to the elevators through a serene hallway with open walls and a water feature on both sides. On the left side we could see all the way to the ocean through the hotel complex and on the right side there was some lushious vegetation. We were taken to the 5th floor by elevator (which you never had to wait for, by the way) and then to our room at the far end of the corridor. When we entered the room, she showed told us how everything works and where things are and also that the music player with an iPod was already loaded with jazz playlists, if we wanted to relax for a bit. 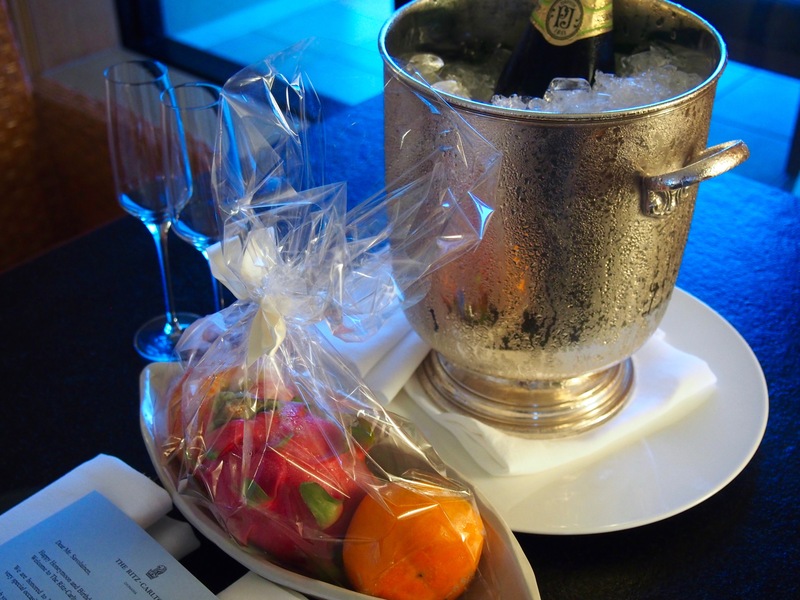 After she left we noticed they had provided us with a surprise honeymoon welcome amenity, which included fruits and some good Perrier-Jouet champagne that I took a liking to during our stay. We popped open the champagne and moved on to the balcony to watch the most incredible sunset we have ever seen. I have to admit that I felt pretty damn happy. This was the beginning of the most relaxing week of our lives, and what a beginning it was. The layout of the hotel might be a little hard to grasp on the first day, so I’ll try to help you out a bit to give some kind of an idea about it. The main building of the hotel consists of 7 floors with the main areas located on the 3rd floor. The lobby, reception area, Lobby Lounge café and restaurants can be found here. In the middle of the 3rd floor, there is a shallow water feature, which looks like a pool. In the middle of the water feature there are walkways and on the sides are the actual structures like the restaurants. There are two terraces on the 3rd floor – one next to the Gusuku restaurant and one next to the Lounge, where you can get food and for example afternoon tea. The pool is on the 1st floor and the bar on the 4th floor. I’m tryin to keep this blog post from expanding too much, so I will write about the food, service and other things in another post. The Ritz-Carlton Okinawa is such a great hotel with much to offer, that I think it’s better to cut these posts into smaller pieces. Our 58 m2 (624 ft2) Premier Deluxe Room was in the middle category of the hotel above the two lower category rooms and below the Cabana room class and two incredible suites. 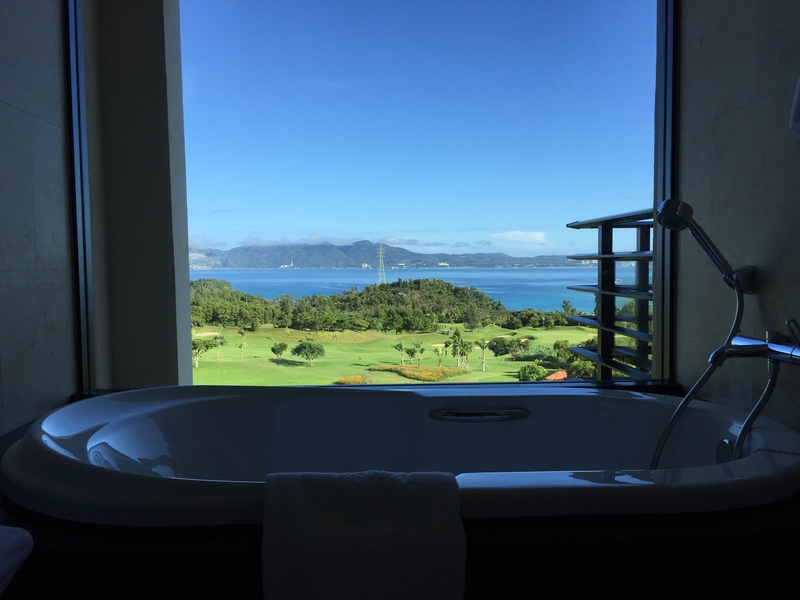 From the room we had an unobstructed view to three different directions – the sea, the city of Nago and the hills and golf court behind the hotel. Let’s begin with the bed. It was literally the biggest bed I have ever slept in – 2,24 meters wide (7,4 feet). When I woke up during the night, I actually thought that I was too far away from my wife and I should move closer… but I might have abandoned that thought, because I was too lazy and just fell back asleep. The bed was excellent – not too soft (which is the worst) and not too hard. The room had a feature I would like to have in our apartment too, which is electrically controlled drapes. All of the windows had see through drapes that provided a little cover and also drapes that made the room pitch black. These could easilly be operated from controls next to the bed. It was fantastic to just push a button after waking up, so that we could see the ocean right out of the bed. The drapes also opened automatically each time we entered the room after being outside for a while. We also had a dining table, sofa, armchair and a TV to enjoy. The only thing missing was pay-per-view channels, because some times I would like to watch a movie in the evening and just relax in the room. However this seems to be the norm in Japan, because so far I have never seen this as an option. I asked for a DVD-player to watch some Big Bang Theory, which we had brought with us and it was promptly delivered to our room without charge. When staying in the tropics (first time for us), great airconditioning is a must. This was probably the best aircon I’ve encountered, because it actually did what you asked of it (unlike the aircons in many hotels, which don’t actually let you change anything) and it kept the room perfectly cool throughout the day. The room also had a separate dehumidifier unit, which ensured the air wasn’t too humid. Also tech-wise the internet in the hotel works like a charm. I had no problem streaming shows from my laptop while there, so you can also get some work done, if you have to (you shouldn’t in a place like this, though). The room was kept extremely clean each day, which is a must for us, because we are very demanding about the matter. One thing I love in 5 star hotels is the turndown-service, which is kind of a small thing, but makes a big difference. 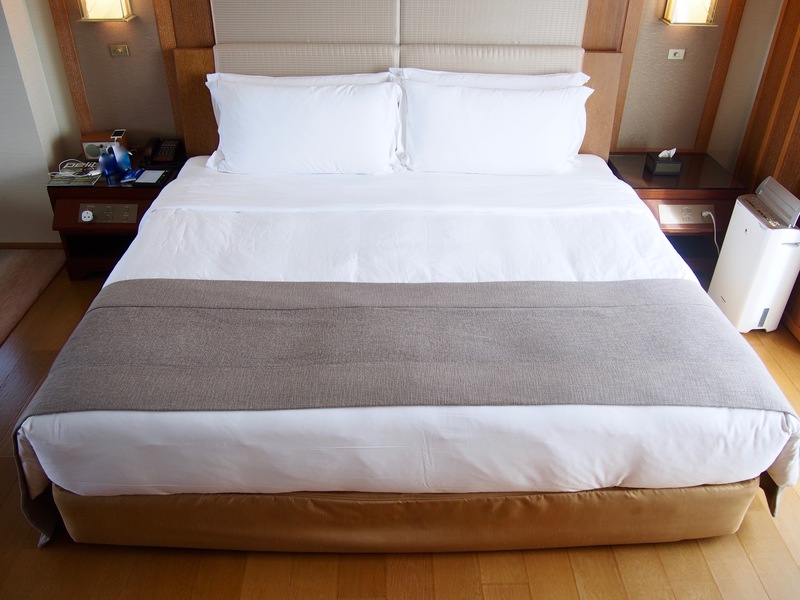 For those who do not know, turndown-service is done in the evening to prepare the room for sleeping. 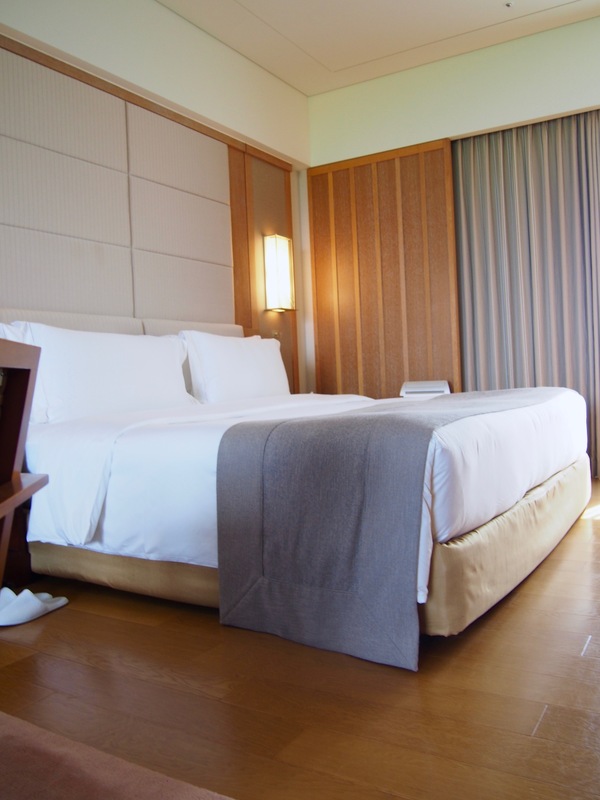 The staff normally lays down small “towels” next to the bed’s sides, puts your slippers there, closes the drapes, dims the lights, does a quick clean up of the room, restocks toiletries and brings some water bottles to the room. In addition to the normal turndown-service in Ritz-Carlton Okinawa they also bring you some candies and the weather forecast on paper for the following day. I usually never buy anything from hotel minibars, because everyone knows they are overpriced, but I was actually surprised that in a five star hotel like the Ritz-Carlton Okinawa the minibar prices were completely reasonable. They weren’t much more than at the local store, so if needed, I could have seen myself using it. It’s also big enough to stock with your own drinks, if that is what you prefer. 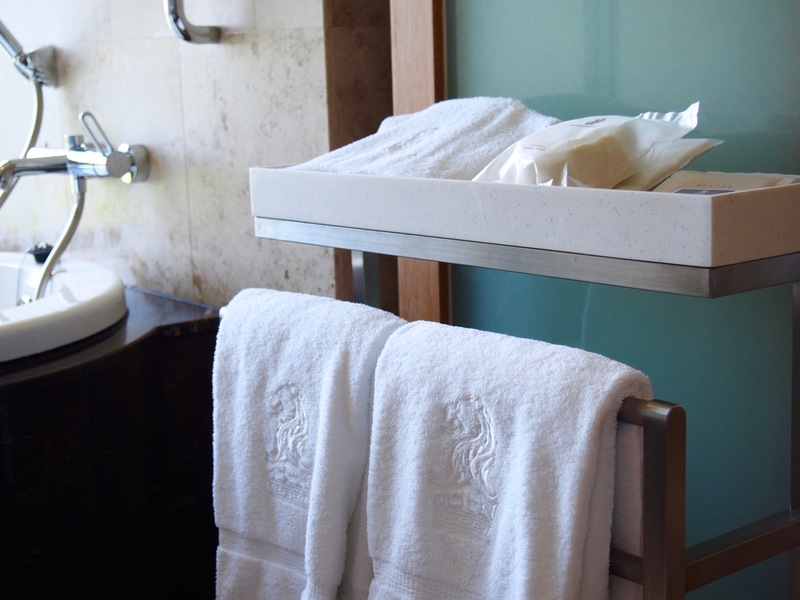 The bathroom is one of the most important things for us in a hotel room. 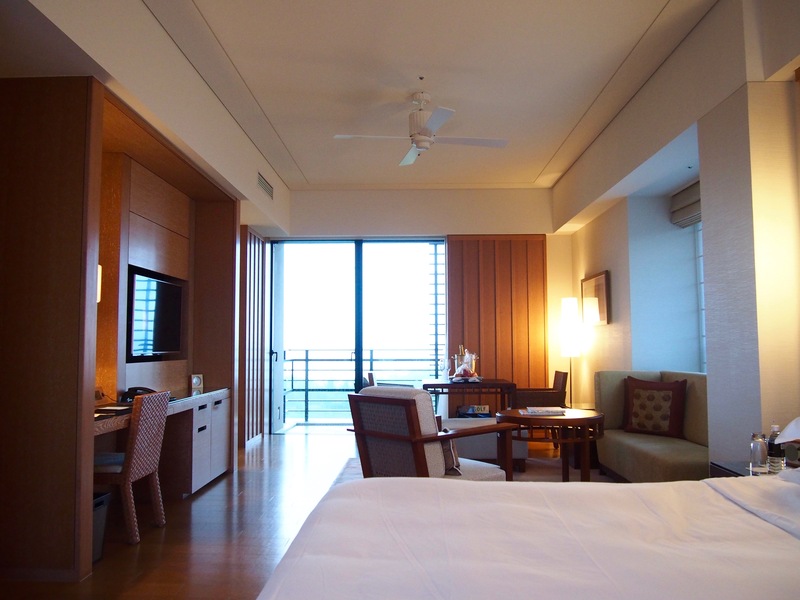 I can gladly say that we weren’t dissapointed with the one found in our room in the Ritz-Carlton Okinawa. The bathrooms of all the normal room categories seem to be the same size and shape, so this is what most of the customers get when staying here. When in Japan, you have to have a high tech TOTO-toilet, with all kinds of functions from a heated seat to different wash options. The toilets in these rooms also have an auto-flush option, so that the toilet flushes when you stand up. 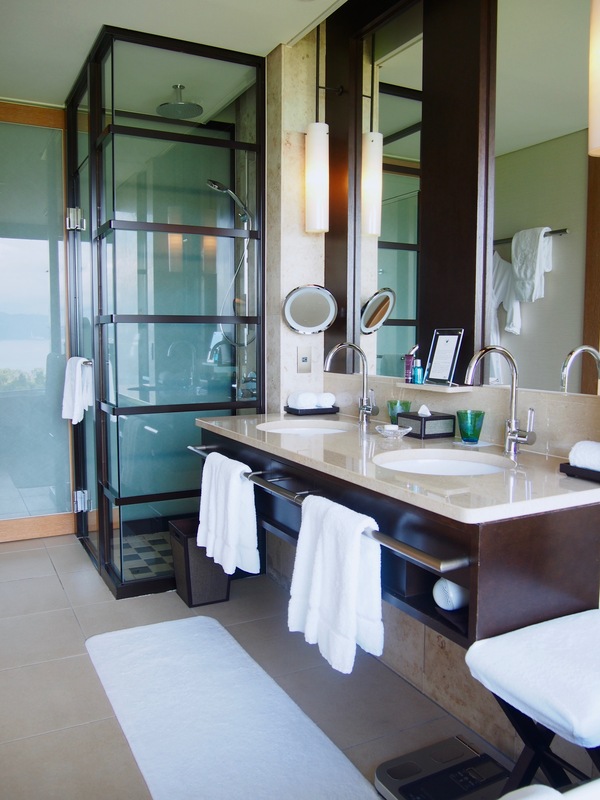 This area is separated from the rest of the bathroom and hotel room by two sliding doors on either side for privacy. 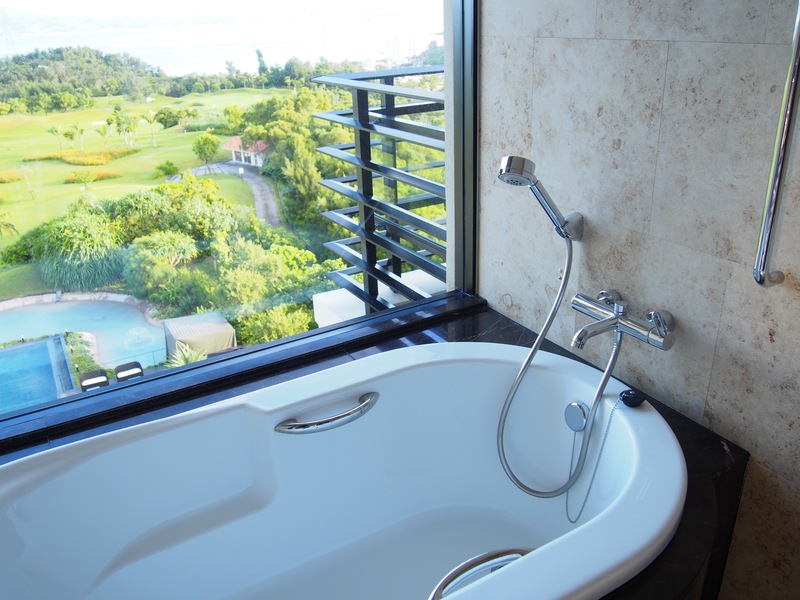 Imagine taking a bath, drinking some champagne and admiring this view – night or day. I liked the fact that the shower was in a separate booth and not just out in the open. The water stayed inside the booth like it should (no wet bathroom floors here) and so did the steam, so that the mirrors didn’t get fogged up. The waterpressure was good and there were no issues with the shower, so I was very happy with it. 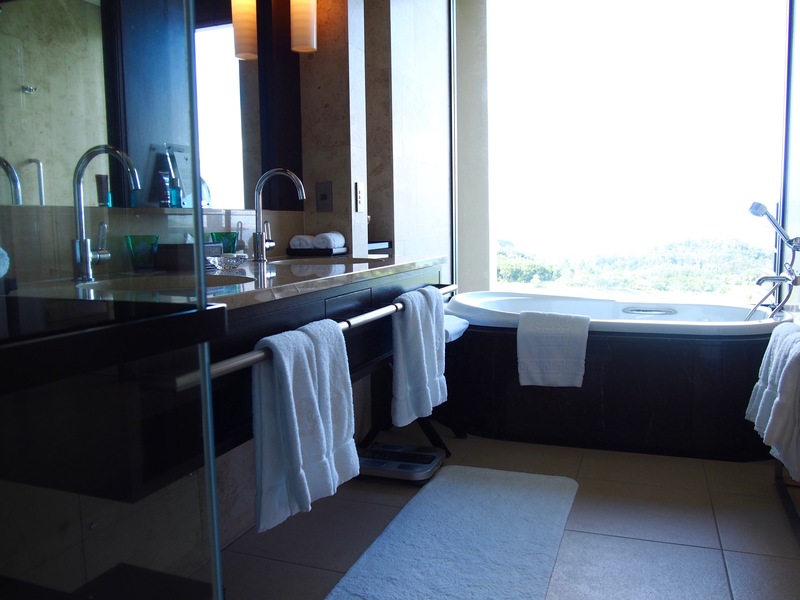 The incredible view from the bathroom to the sea was also visible straight from the shower, so that was a huge plus. The bathroom had two sinks and enough counter space for both, which is very helpful especially in the morning when getting ready. 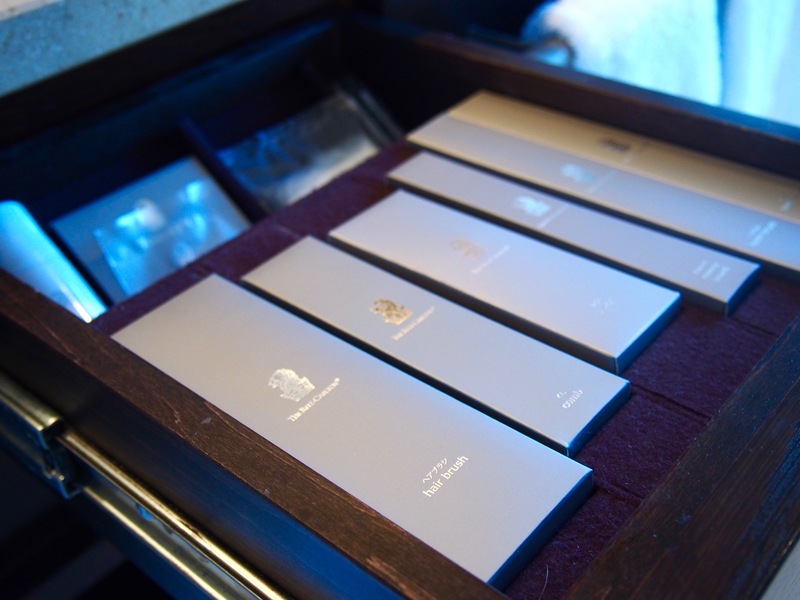 Asprey shampoo, conditioner and shower gel, luxurious looking Ritz-Carlton toiletries and special bath salts make sure that customers have everything they could need. There was even a detachable pillow for the bathtub. And talking about the bathtub, this is where you find perhaps the best seat in the house. 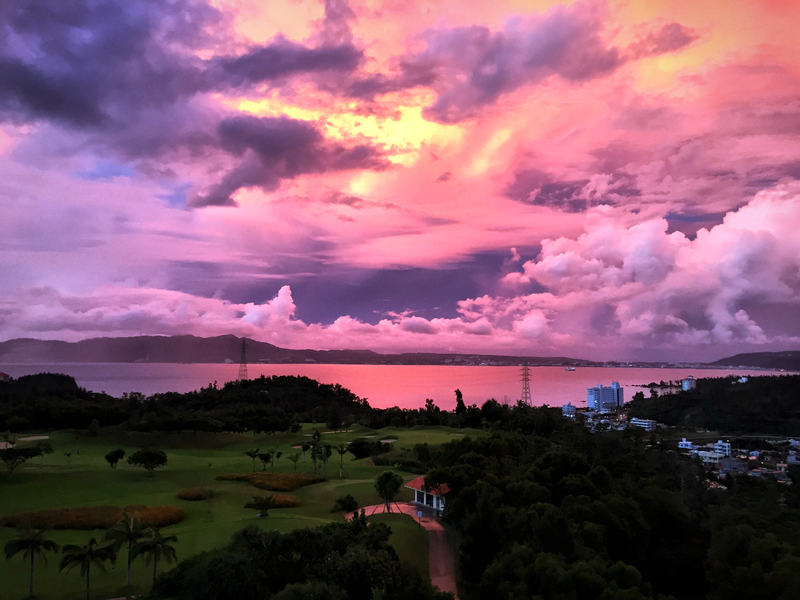 The views over the golf course onto the bay are just gorgeous. You can even watch the stars from the tub at night. 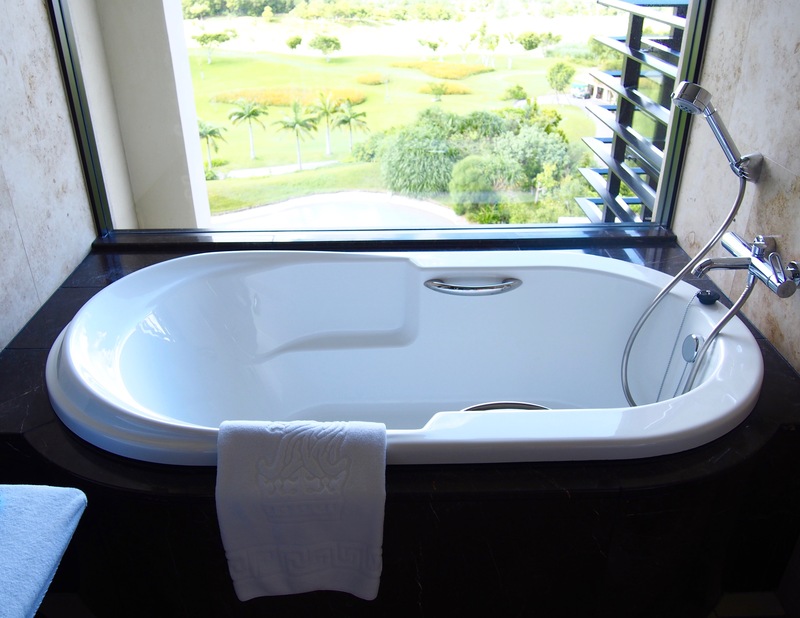 Also the tub itself was comfortable and big enough for two, so everything was as it should be. 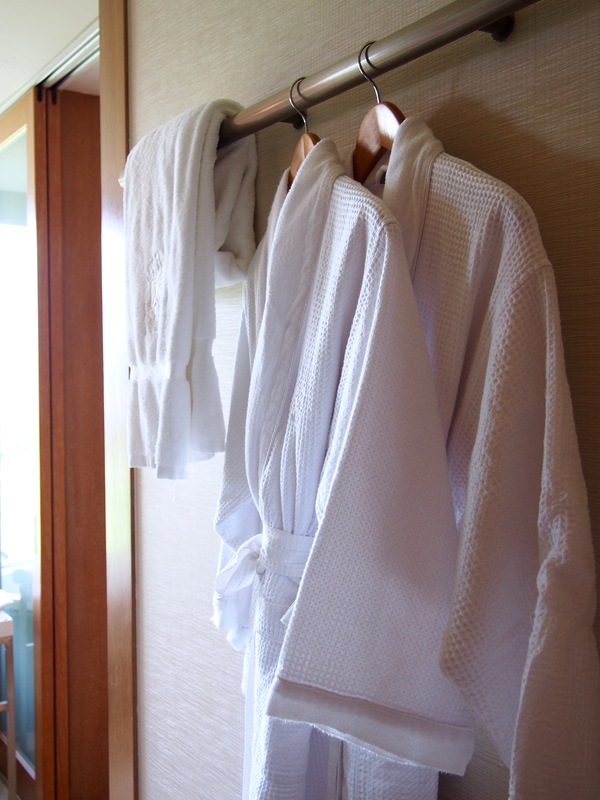 Of course a five star bathroom wouldn’t be complete without comfortable bathrobes, soft slippers and even pyjamas, which can all be found from the room. 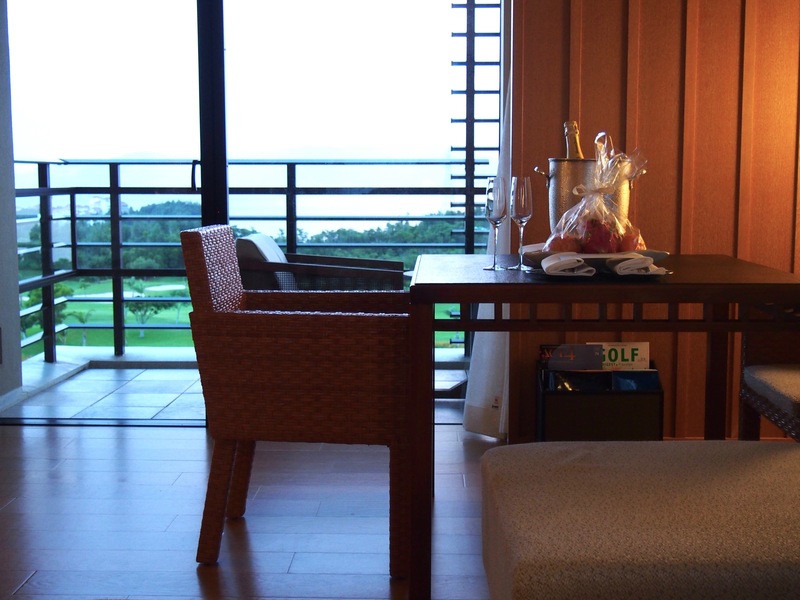 As you can see, I really don’t have much bad things to say about the Ritz-Carlton Okinawa. 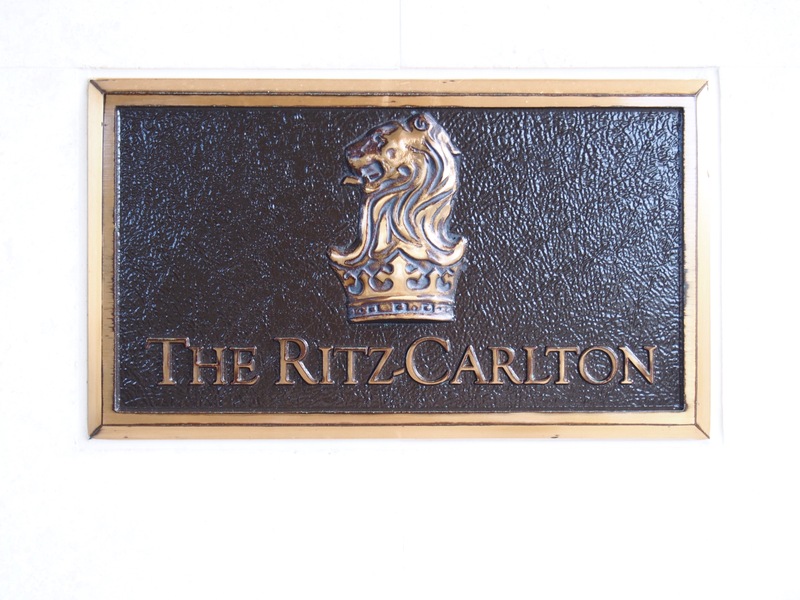 That is no surprise when thinking about the fact that the Ritz-Carltons are famous for their luxurious properties and fantastic customer service and to top it all off Japan happens to have the best customer service overall, so these make one fine combination. This was the best hotel experience I’ve had so far. 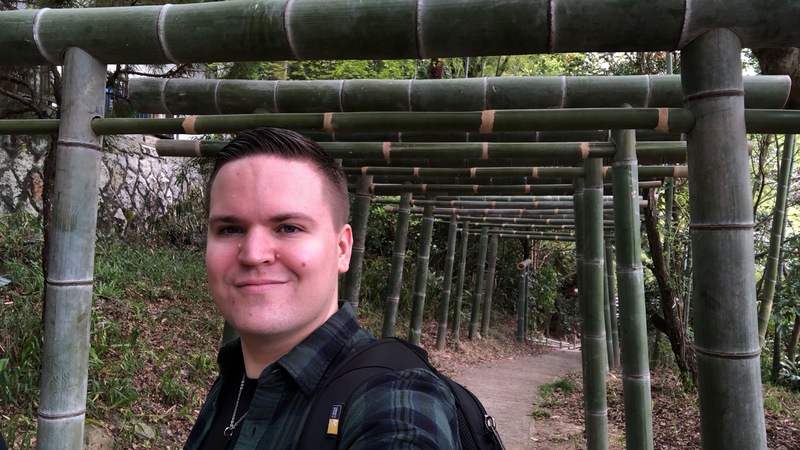 As I said, I couldn’t write everything into this one post, so there will be at least one more post about the food and breakfast in the Ritz-Carlton Okinawa, but I might write even more about the hotel, so stay tuned. 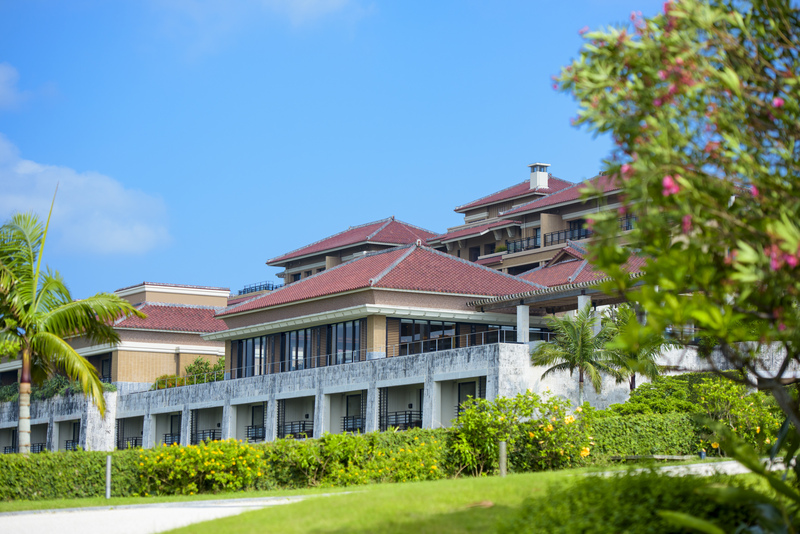 If you are looking for a relaxing and above all luxurious experience in Okinawa, this is the hotel for you. There really isn’t any other contender that comes even close to the level of service, rooms and everything this hotel has to offer. Even though the environment and the hotel itself are great, they wouldn’t be anything without the fantastic staff that makes everyone’s day brighter with their love for the customers. If you appreciate great customer service like we do, you should definitely make the trip here to experience it fully – Okinawa style. I want to thank everyone at Ritz-Carlton Okinawa for making our honeymoon the best possible experience it could be. Especially I want to thank Takao-san and Yuka-san for making this all possible. Arigatou gozaimasu! This trip will stay in our memories forever. We will surely be back again to watch the sunsets as soon as possible, so keep the drinks cold and the service warm! 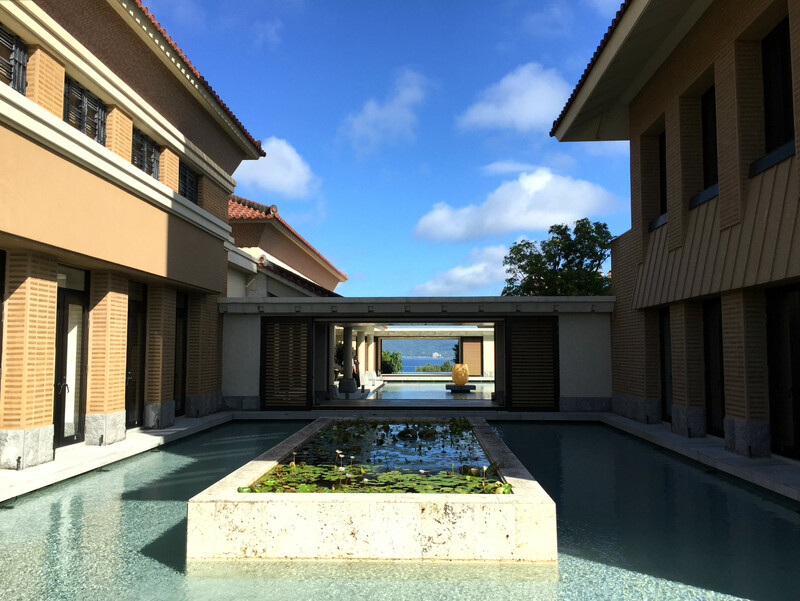 From these links you can find more of my posts of Ritz-Carlton Okinawa regarding Okinawa in general, the food and the service. 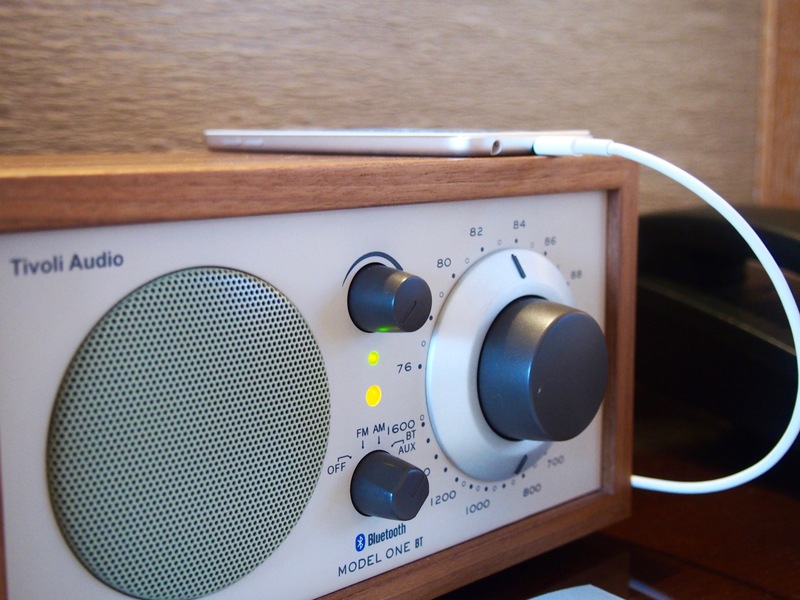 So what do you think of this hotel or the brand itself? Have you ever visited one of these fine properties? I’d love to hear your thoughts, so please leave a comment below. If you want to keep up to date on my newest travels, please go and follow the blog on Facebook and Instagram. Great, detailed overview and love the pics! I see they gave you a dragon fruit along with the champagne. Those are a delicacy, and my favorite! Such a nice little detail from the hotel. Sorry I didn’t see these comments earlier, but they didn’t show up like they are supposed to :/. I’m allergic to most fruits, but it’s a good thing my wife can eat them, and of course it’s a great gesture from the hotel :). Champagne is definitely my thing. Thank you for your comment!